This is the most delicious mint tea. Absolutely love this! One of the best mint teas I've ever tasted. So good. Very good mint tea refreshing and non GMO . I went all the way to Seattle Washington at the Cheese Factory to discover that this terrific mint tea was in my own backyard. I ordered it as soon as I got homwe. It's light, very flavourful and the mint taste is perfect. I'm a fan forever. 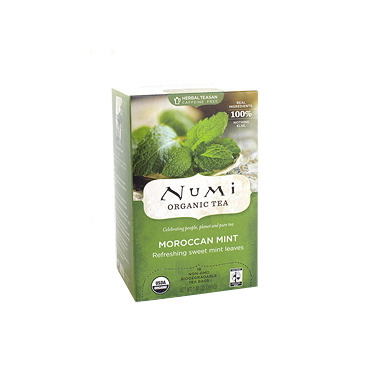 I am hooked on Numi teas --taste, quality-- it doesn't get any better than this!! Probably, my favourite is Moroccan mint. However, I have many different teas and they are all wonderful. Fresh, sensual and tantalizing! It's wild mint, of course. I love this tea. The mint flavour isn't super strong, just nice and light, and very soothing to drink. Plus the packaging on this tea is beautiful. Any of these teas would make a great tasting and looking gift for any tea drinker.